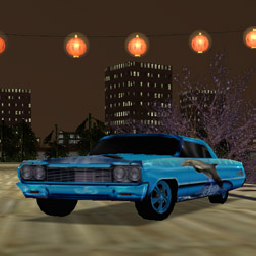 CAR NAME : 1964 Chevrolet Impala "Dolphins World"
Something to keep up the motivation. This is a conversion and modification of a modification of a conversion of a car from Motor City Online. Are you disgusted yet? This was meant to be part of a pack I had an idea for, that was six years ago and it's not happening. So here it is. Parameters are from the same era of my style. Quick, 46 MPH and quirky handling to go with. The original model was made for Motor City Online by EA, converted to Need for Speed: High Stakes by Sniper, further modified by NightmareNMX.